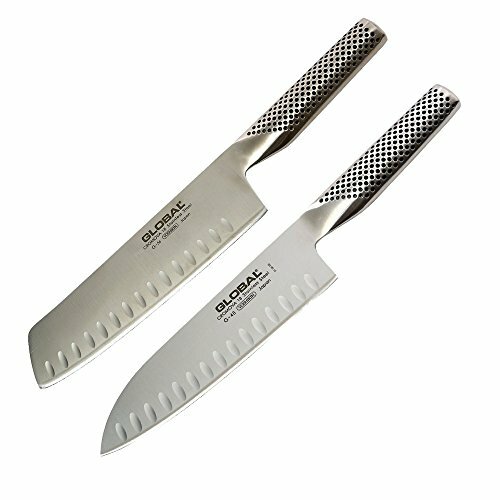 Global's sleek, razor-sharp cutlery is an excellent choice for professional chefs and discerning home cooks alike. The broad blade of this nakiri knife enables you to slice everything from melons to squash with ease. Hollow edge features scallops (called "kullens"), which keep food from sticking to the blade. Plus, the double-beveled edge accommodates both right- and left-handed users. Lightweight design features perfect balance, helping reduce hand fatigue and providing you with greater control. GLOBAL has razorsharp straight edge sharpened by hand at a 15% angle. Thinner blades for lighter weight giving you more agility with less fatigue. Perfect balance using a weighted hollow handle. No bolster design allowing for full edge use and full-blade sharpening. All stainless steel construction with slip free handle. Both are lifetime warranty against defects and breakage.